Ambition, betrayal, love, greed and blood. 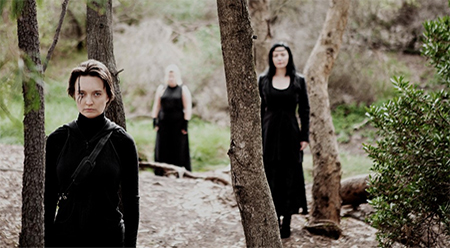 wit incorporated brings Shakespeare’s famous tragedy to the stage in Melbourne’s inner west with The Tragedy of Macbeth at Footscray’s Bluestone Church Arts Space in August 2016. A prophecy from a trio of witches foretells Macbeth will one day be Queen. Consumed by ambition and goaded by her husband, Macbeth murders Queen Duncan and takes the throne. The tyrannical reign that follows, filled with guilt and paranoia, results in a bloodbath and civil war, as Macbeth and Lord Macbeth fall deeper into the realms of madness and death. “Macbeth is set roughly 500 years prior to Shakespeare’s time, yet still appealed to an audience who were able to see their own struggles reflected on the stage,” says Director Jennifer Innes. “The themes of ambition, corruption, greed, power still move us, because they are universal – even if the scope and focus of our struggles may change. “We have all battled with greed; with the desire to break our own moral code just a little bit to get ahead. We have all taken the less ethical, more self-serving option at times – pushing back the line of right and wrong. But at what cost? What happens when humans go too far and lose their humanity? Every time we turn on the news we are flooded with answers to this question. The production sees a nation of powerful women and subservient men thrown into turmoil by Queen Duncan’s murder. wit incorporated Artistic Director and co-founder, Belinda Campbell says playing Macbeth has been an enlightening experience.